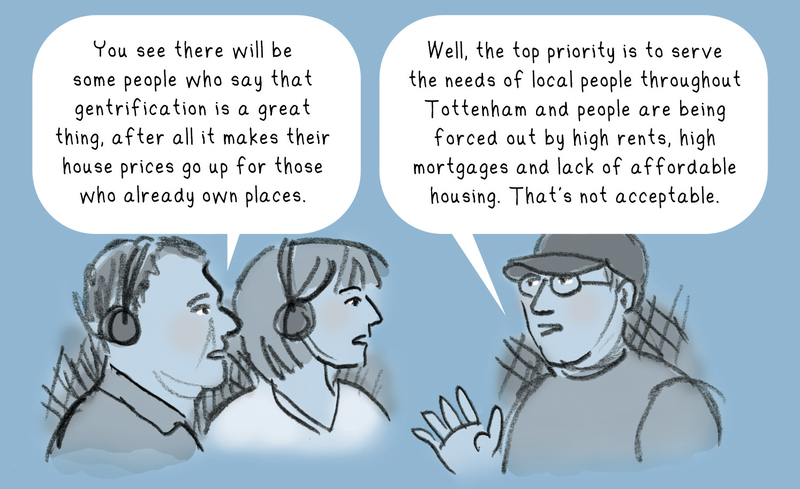 Dave Morris interviewed on BBC Radio London. 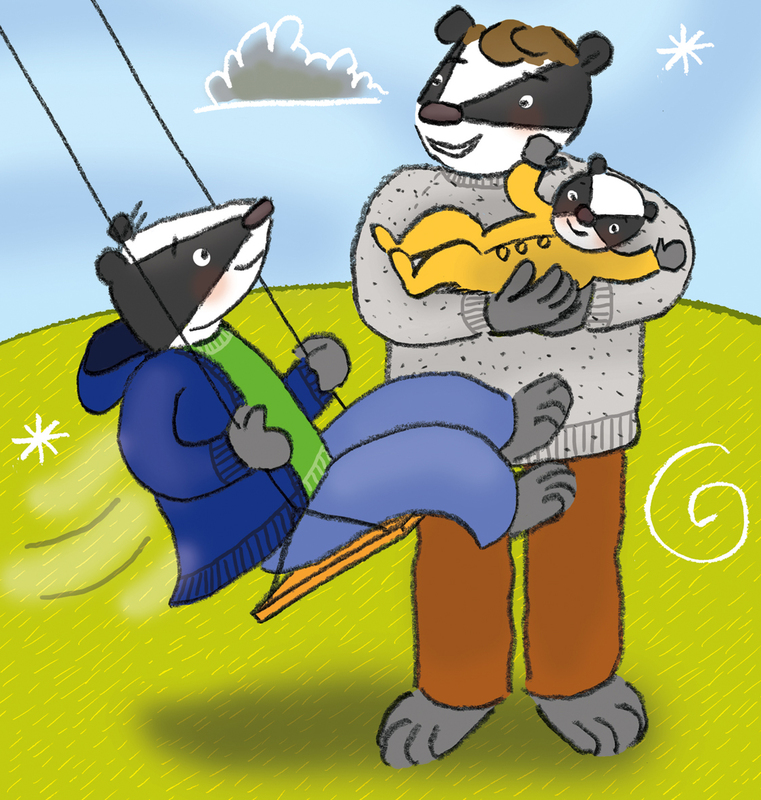 Illustration by Amanda Lillywhite. Tottenham's Trojan Horse? is based on one of the case studies in Mark Panton's doctoral thesis about stadium-led regeneration. I helped Mark edit his thesis and during this process we had many conversations about a community in High Road West, Tottenham. Their homes and businesses may be demolished to clear space for a fans' walkway from White Hart Lane train station to the entrance of the new Tottenham Hotspur Football Club stadium and they have joined together to challenge the proposals. Mark and I decided to create a book that would use his research to tell the story of how the fans' walkway proposals came about, show the impact on the people affected by it and what they are doing in response. The best way to do this, we felt, was to use a comic format, base it around dialogue from interviews and make it accessible to a general audience 14-years-old upwards. The book was published in February 2018, there have been two print runs and copies have gone to people in 8 countries. It has won an award and has been featured in a number of articles and interviews. 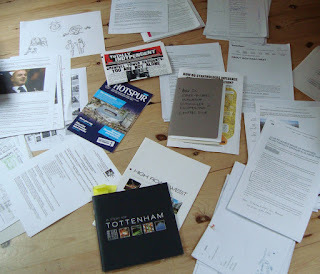 Please visit tottenhamstrojanhorse.blogspot.com for more information including how to buy the book or read it for free. "Tottenham's Trojan Horse?" is not available on Amazon. The first episode, there are five episodes in total. 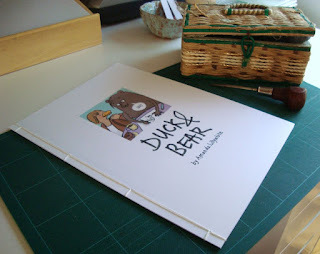 Duck & Bear was originally created as a webcomic but is now available on Big Cartel as an A4 handmade Japanese-bound comic. Duck is a writer and Bear is an illustrator, the story explores their creative processes and friendship. It's warm, funny and family-friendly but best suited to older children and adults. UK price of £6 includes shipping, overseas buyers or anyone with any questions please message Amanda via the contact form on this blog. The comics are handmade and Japanese-bound. 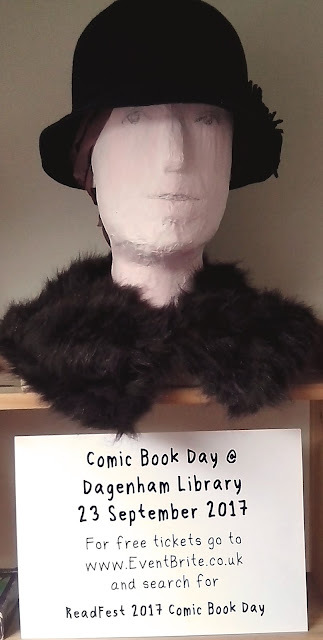 How to book a free ticket for Comic Book Day at Dagenham Library (there is a link at the end of this post). 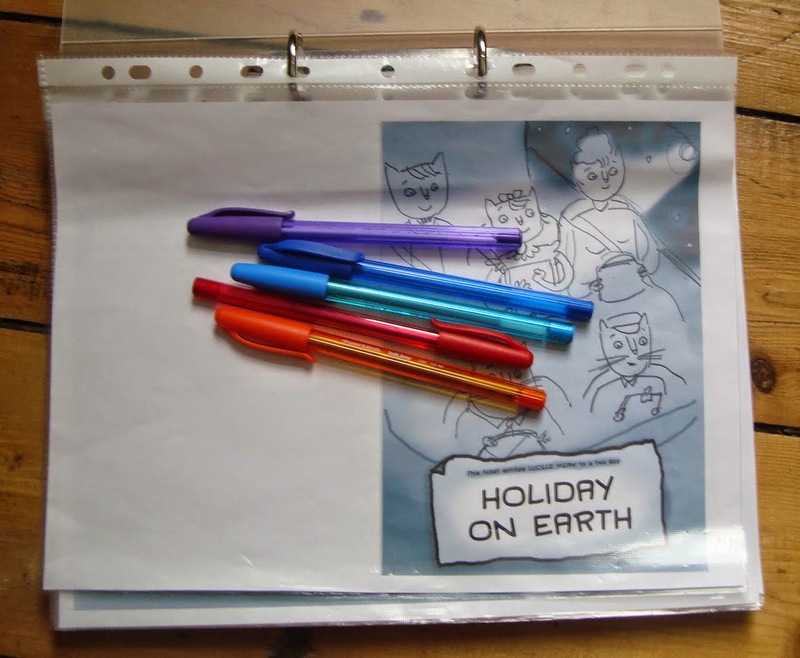 On September 23, from 2-5pm, I will be running a drop-in autobiographical comic workshop at Dagenham Library. It will be suitable for all ages and all abilities. 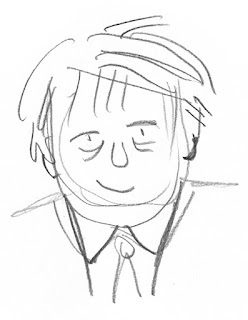 The comic can take any form but my suggestion would be to make it about something that has happened that day - like an entry in a diary. Part of a 24 hour comic I made a couple of years ago, it was created during the course of a day. If you are interested in comics, zines or graphic novels it's fine to just drop by for a chat. A couple of my zines will be on sale. I will also have information about the workshops I'll be running at Barking or Dagenham Library starting February 3 next year - 6 sessions that will lead to participant comics being published together in a book. Plus the lady in the photo, Catherine, will be with me - she is a character in a zine I'm working on at the moment. Besides my workshop there will be a poet, comic book retailers, publishers and more. For free tickets to Comic Book Day and more information please register on EventBrite or phone 020 8724 3942 or email LBBD. You can email me via the contact form on this blog if you have any questions. Comic Book Day is part of LBBD's ReadFest 2017. Information about other ReadFest events is on EventBrite and available at LBBD libraries. Non-fiction graphic novel "Tottenham's Trojan Horse? 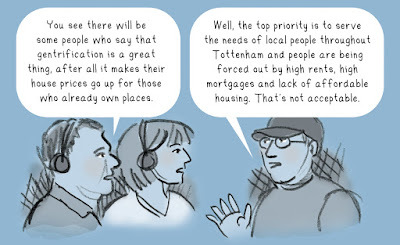 A Tale of Stadium-led Regeneration in North London"
In 2010 Haringey Council in London granted planning permission to Tottenham Hotspur Football Club for a new stadium and other linked developments. 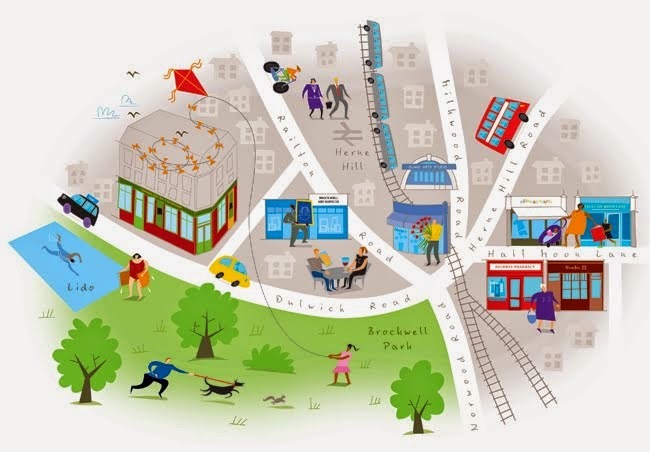 In 2012 Haringey unveiled regeneration plans for the borough that included demolition of homes and businesses to make way for a proposed fan’s walkway from a relocated train station to the site of the new stadium. A process that was already challenging for the football club, the council and the local community now became tortuous. Those most affected by the proposals felt left out of the decision making and had to find a voice. The floor of my workroom. 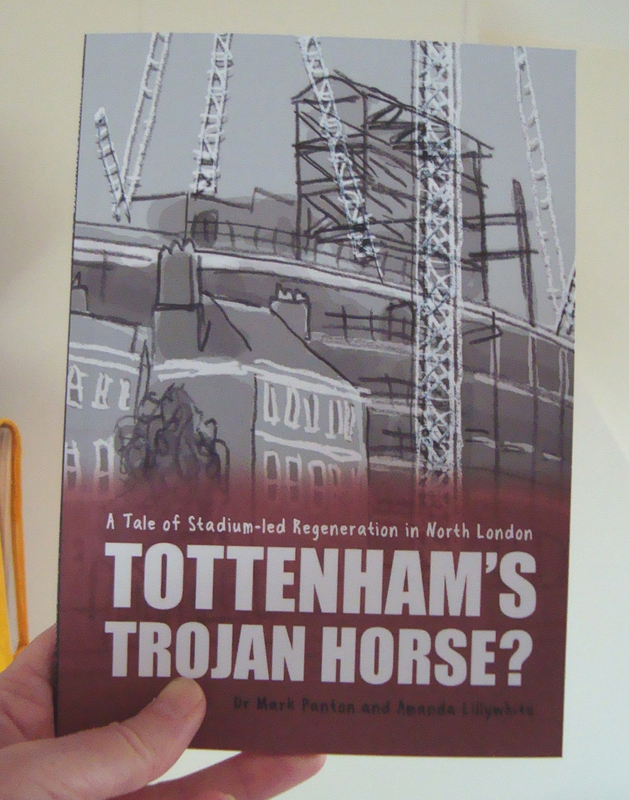 In the next week or so we'll have a draft of "Tottenham's Trojan Horse?" ready. 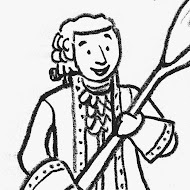 All text will be in place and will have been edited several times but the drawings are either rough pencil sketches or photos that I'm using as placeholders. Before going any further we're going to show it to others for their input. This is to make sure the book will be factually correct and easy to understand. The story is taken from one of Dr Mark Panton's case studies in his doctoral thesis, rewritten so as to be accessible to academics and non-academics 14-years-old upwards. 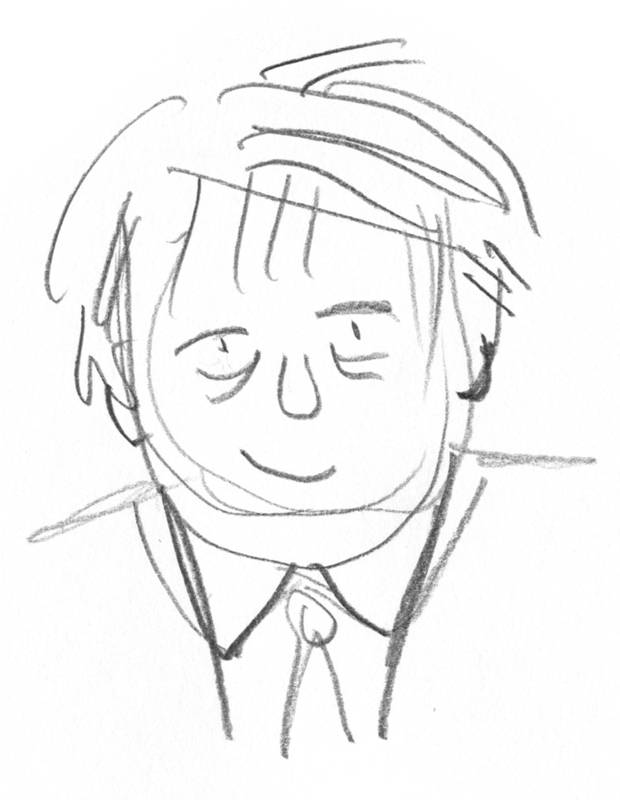 A rough sketch of Boris Johnson. We have started up a blog and a Facebook page to post further progress of the book but please contact me if you have any questions. The book will be published in early 2018. The title page for the story. The main character's name is Bernie. 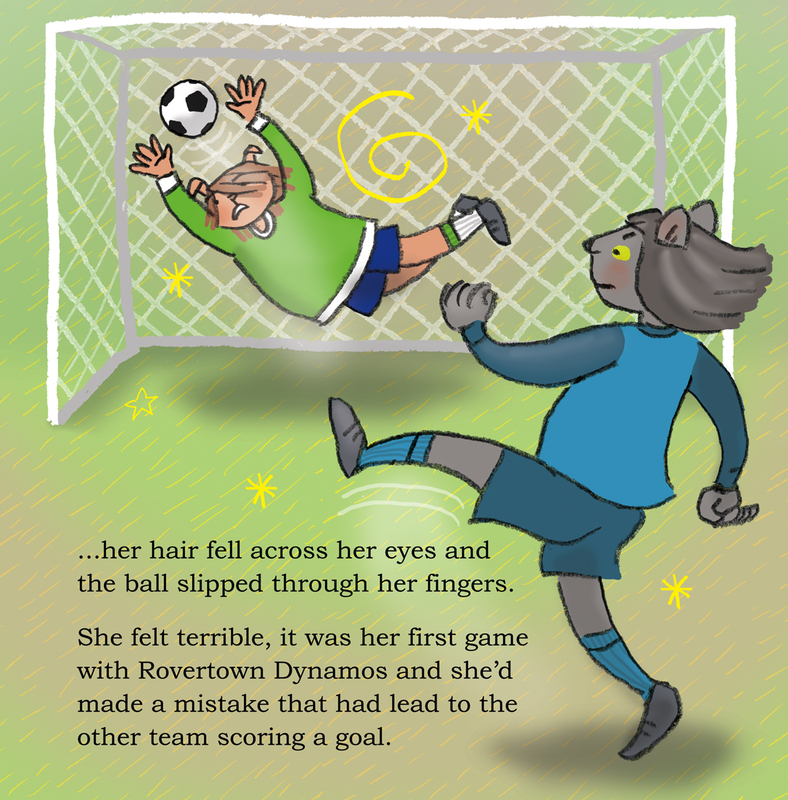 Rovertown Dynamos vs. Mogford Juniors is one of three illustrated stories I wrote and illustrated for a children's book published by The Neuro Foundation - a charity that supports people of all ages with Neurofibromatosis. 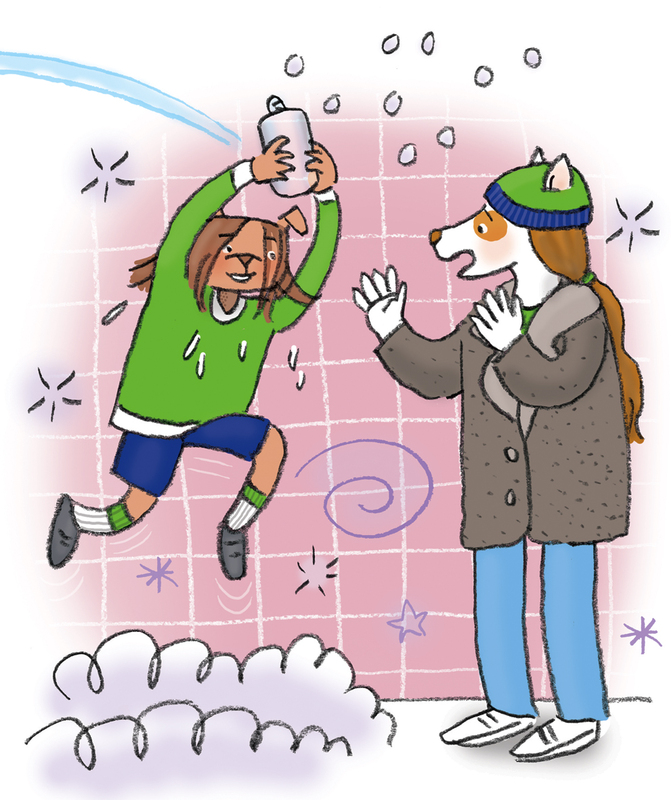 The Neuro Foundation wanted the book to be warm and life affirming and for one of the stories to be about bullying (they had requests about the other stories but I will talk about them another time). At first I was worried about how I could write about bullying in a positive context and then I thought about setting the story in a football team. I should point out that I know very little about the game of football, although I have been around football fans all my life somehow the game itself washes over me. However, my partner Mark Panton and our daughter have shown me something I can relate to - the positive side of the culture of football. They are both fans of Dulwich Hamlet FC in South London, a non-league club that goes out of its way to be inclusive and supportive of all kinds of people. Our daughter is autistic and has mild learning difficulties. She has been watching Dulwich Hamlet matches with Mark since she was very small and has been able to have a level of independence and interaction during the games that is difficult to achieve elsewhere. Both on and off the pitch there is warmth and camaraderie; my daughter is safe to wander around during matches and no one judges her. It occurred to me that if a football player was insulted during a match their team would immediately rally round to support them. This was the starting point for Rovertown Dynamos vs. Mogford Juniors. The teams in my story are both made up of girls. 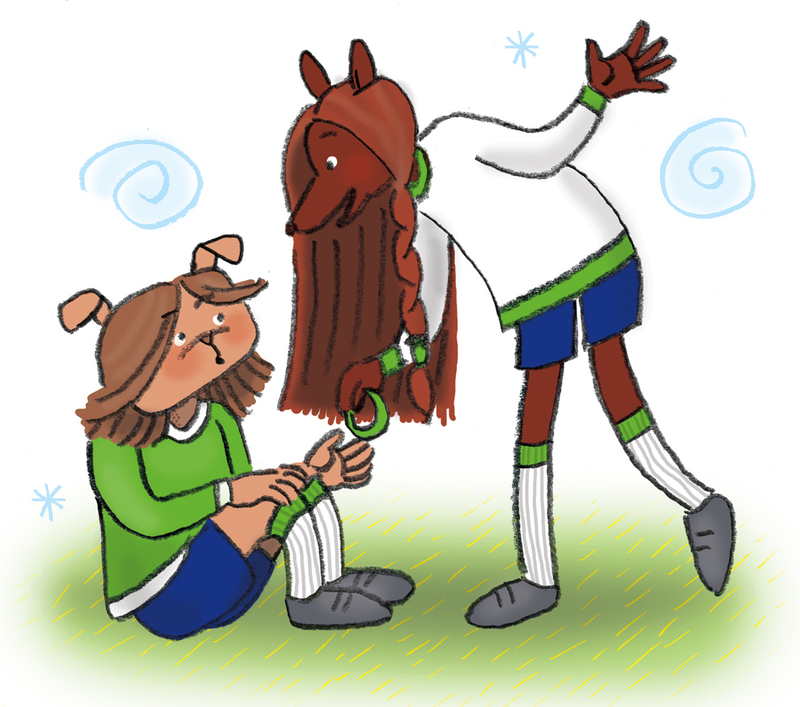 There are lots of stories about boys playing football and I feel that girls are too often overlooked. I know from experience with my daughter that girls can be passionate about the game and that there aren't enough opportunities for them to play. In my small way I am trying redress the balance a little by showing girls being good at football and being taken seriously. The moments of emotion that are in any game of football helped drive my story along. 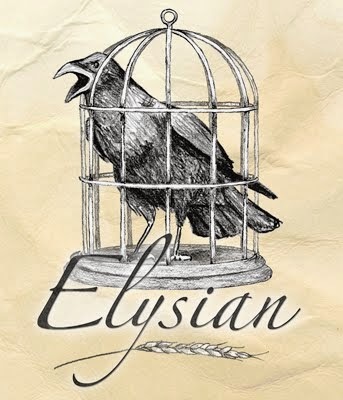 I won't give away the plot except to say that the main character has Neurofibromatosis and she is teased by an opponent because of one of the outward signs of the condition. But she is a great goalkeeper, her team help her see that it doesn't matter what others say about her and there is a happy ending. 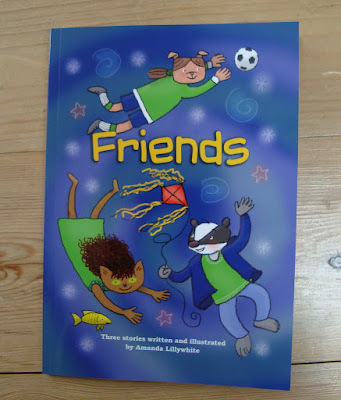 The book is called Friends and it is available on The Neuro Foundation website. You can find out about Dulwich Hamlet Football Club on their website and go to the FA website to find out about women's and girl's football. Many thanks to Mark Panton for advising me on the detail of football games. 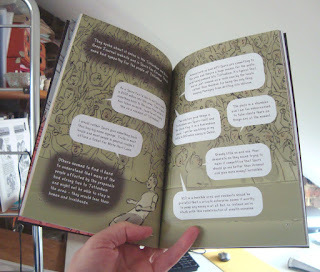 I loved working on this book. The charity I created it for, The Neuro Foundation, was supportive and positive all the way through. They help to improve the lives of those affected by Neurofibromatosis and helped me understand the condition by introducing me to a specialist and to children with Neurofibromatosis. The children and their families spoke to me about their lives and experiences, I am grateful to them for their time and honesty - they were inspirational. 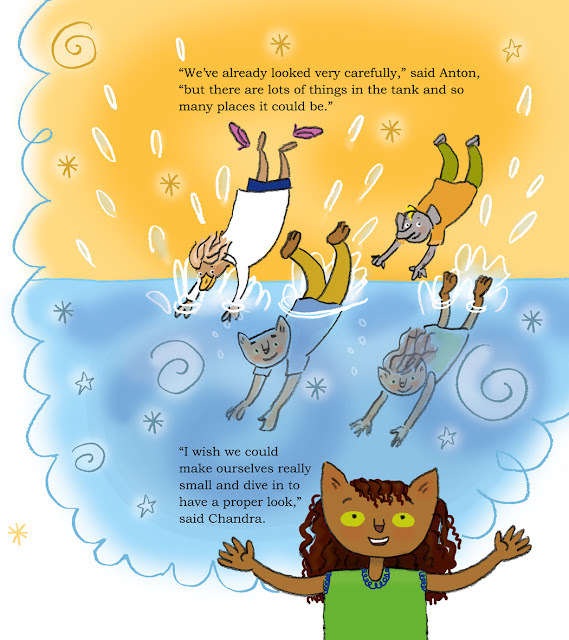 I was commissioned to write and illustrate three life affirming stories that featured main characters with Neurofibromatosis. 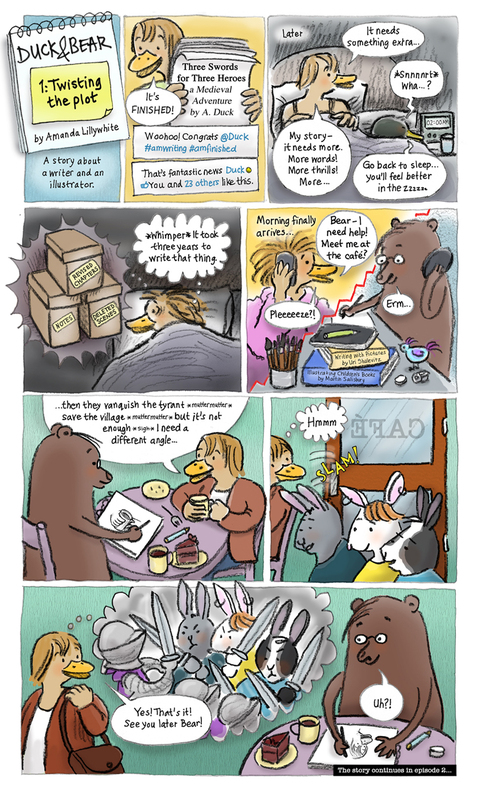 The Neuro Foundation wanted the stories to be fun, fully illustrated and easily accessible. In the first story, The Windiest Playground in the World, Isaac wonders if he'll be able to make friends after moving to a new area. Part of an illustration for The Windiest Playground in the World by Amanda Lillywhite. 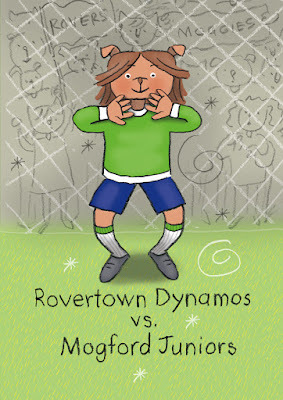 The second story is Rovertown Dynamos vs. Mogford Juniors. Goalkeeper Bernie needs help from her team when an opponent says something mean about her. 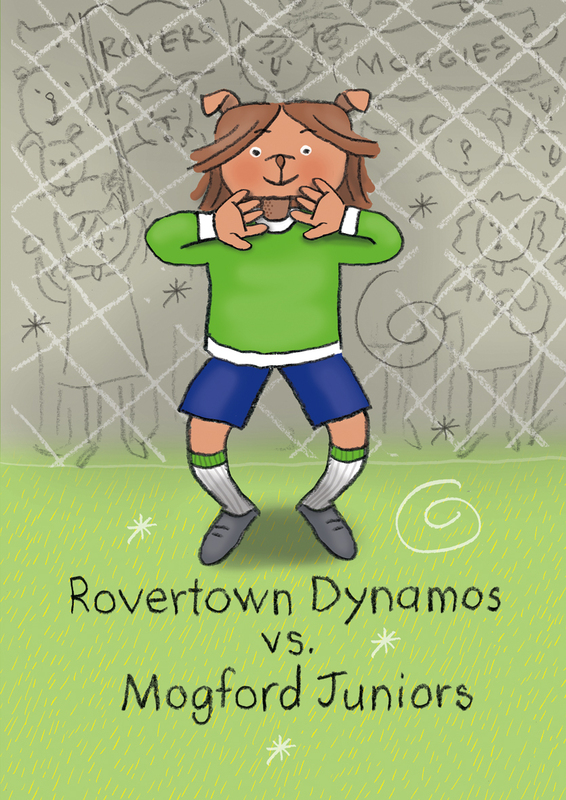 Part of an illustration for Rovertown Dynamos vs. Mogford Juniors by Amanda Lillywhite. The final story is The Missing Fish. Chandra is worried about a fish that seems to be missing from the waiting room tank when she goes for her regular check up at a clinic. An illustration for The Missing Fish by Amanda Lillywhite. Friends is available on The Neuro Foundation website, along with information about Neurofibromatosis and support for those with the condition. 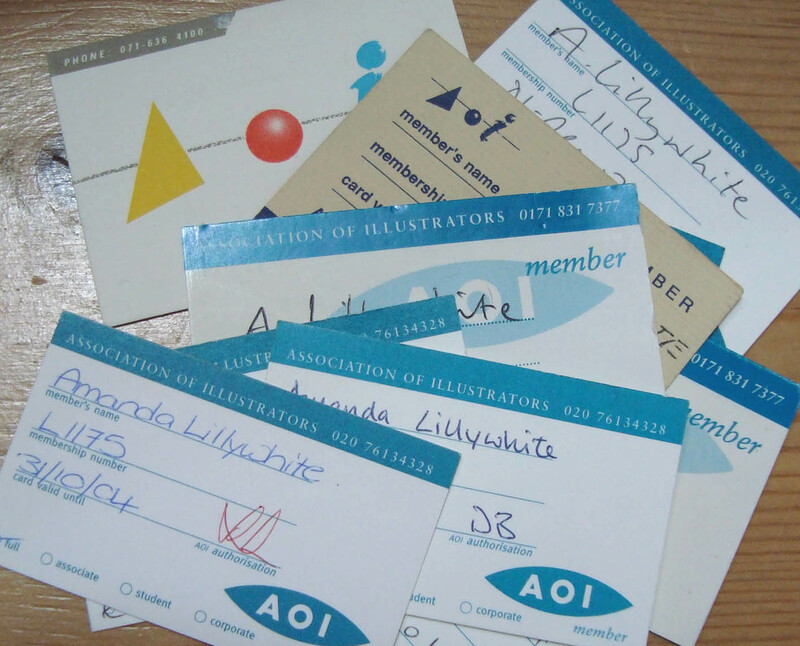 As you can see in the photo above I was a member of the Association of Illustrators (AOI) for seven years. The contract and business information I received from the AOI during my early years as a freelance illustrator was a great help and I made good use of the hotline for advice. Later on I benefited from the social side of the AOI when I moved to Cambridge for a couple of years and got to know illustrators at the local branch meetings. 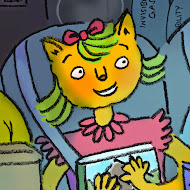 Up until myself and my partner adopted our daughter I was working full-time or more as an illustrator and managing to earn a reasonable living. 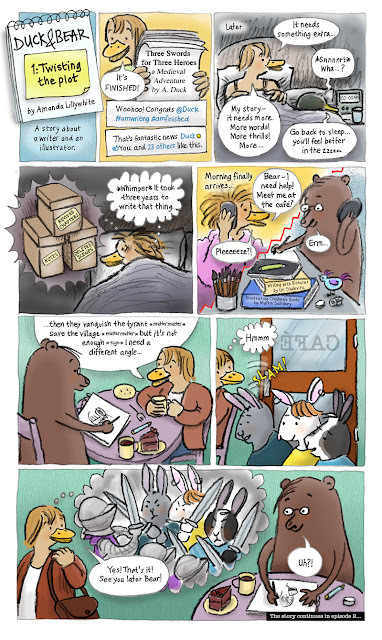 While my daughter was young my work hours dropped off and though I never gave up illustration I became cautious about how much I would take on so as to ensure I could hit my deadlines. It became hard to justify paying the yearly fee so, although I missed the AOI, I stopped renewing my membership. In recent years my commissioned illustration work has built up to the extent that rejoining the AOI seemed a necessity and was also affordable. I've just received logos and other new member materials and was touched by the wording on the image below. It's true, the AOI really are like that - they've been looking after illustrators for a long time and protecting our interests. I am very glad to be back. Note: I should mention that during the gap in my AOI membership I joined the Society of Children's Book Writers and Illustrators (SCBWI). I received a different kind of support from them, made some amazing friends and started writing. 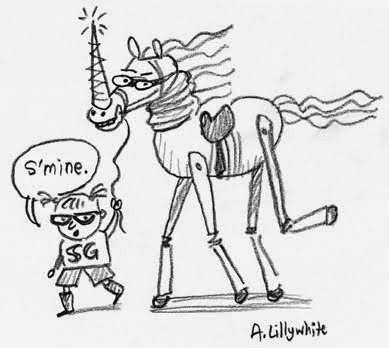 Though I've allowed my SCBWI membership to lapse I will rejoin as soon as I can.